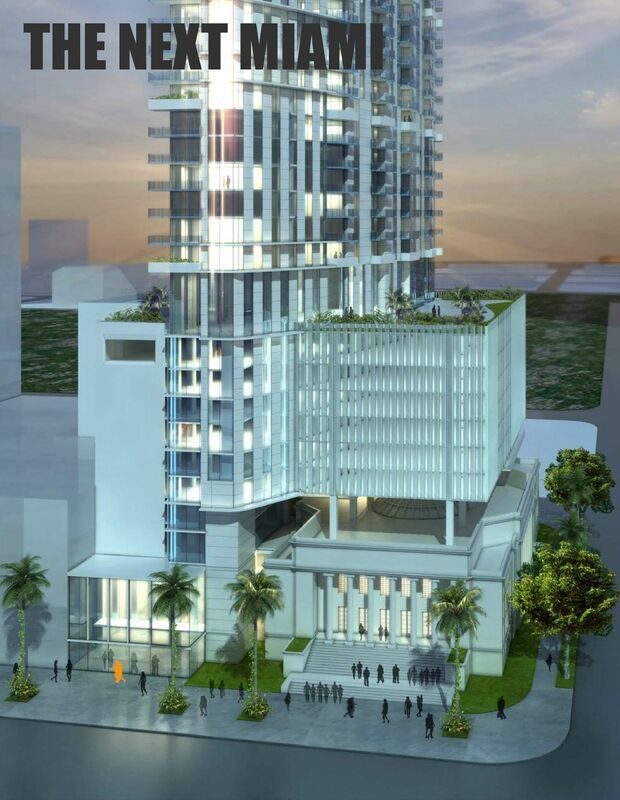 Architect Add Inc has prepared a creative plan to preserve the historic church at 1836 Biscayne Boulevard, while adding 352 residential units and a parking garage. Under a proposal scheduled to be reviewed by Miami’s Historic and Environmental Preservation Board next week, the church would be restored and retrofitted to become hurricane-resistant. Instead of a place of worship, a grocer would occupy the space. A 34-story residential tower would be built next to the church. ‘Floating’ above the former church would be a parking garage. In total, up to 480 parking spaces are planned. Developer Fifteen Group paid $14.25m for the property last year. R.J. Heisenbottle Architects is working alongside ADD Inc for the developer as a historic preservation consultant. 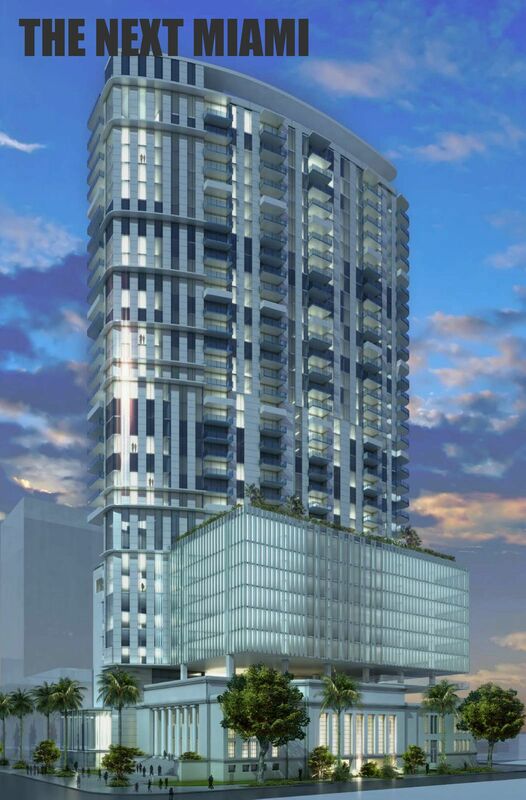 The church is directly across the street from Atlas Capital Group’s newly proposed 429-unit residential tower at 1900 Biscayne. Hideous, horrible. Words cannot describe how bad that looks. oh stop it, no its not. I agree, it actually looks pretty cool. the church makes it that much more interesting. I think anonymous is being ficitous and sarcastic to beat the critics at their own game. then it didnt go over here as well as it did in their head. This isn’t an ARQ building silly. ADD Inc has been stepping up their game. Everything is good except that “floating parking garage”.It should go behind the building,not on the top of beautiful historical church building.I see it in the future as a library or some kind of book store. Oh boy, here we go again. When these preservation nuts gets envolved, their nitpicking ruin everything. This is pretty much how preservation should be done. Love it! With two new buildings now in this area, I wish Publix would step up their game. Very disappointed in their selections and wait times at the Deli and hot food counters. Maybe the “church” will become a Trader Joe’s ? This proposal is insulting in so many ways, not least of which lacks any sense of architectural integrity and respect. These “urbanistic” solutions which claim to respect historical structures but in effect ridicule them have started to pop-up around town and I’m afraid if the local codes and historic preservation boards don’t address them soon we will have many of these monstrosities built by developers who could care less about good architecture or urban design. Don’t understand your gripe. Are you criticizing the resendential development or are you criticizing what they’re planning to do with the church, or both? I have a couple legitimate gripes about the plan. First, no one is going to go to a supermarket that requires you climb 15 steps to the entrance of. Sure, it would be a beautiful supermarket, but it would just be super impractical. My other gripe is that it looks like they have the parking above the old church. Parking pedestals never look as good in real life as they do in a rendering, and this parking pedestal looks pretty bad in the rendering. I’m thinking there will be an internal elevator entrance/access via the garage like other grocers and the entrance via Biscayne is for foot traffic. The pedestal, which I agree is the one component that is aesthetically unappealing, can always be improved upon. Thinking no one would want to climb “15 steps” to a grocery store is not a complaint, unless you yourself plan on shopping there, it’s just an assumption. Your gripe about the parking pedestal I’ll agree with and would prefer they put it on the opposite side of this building. I would climb 15 steps for a Trader Joe’s. LOL – Actually it may turn out to be 3! Cinemex in Brickell City Centre, Silverspot in front of the new Whole Foods, and the yet unnamed theater in Miami World Center. I just love Miami! They should give the garage an older / modern look to match better. Definitely. The rest if the building is diff from mold so I like that. Thumbs up. I hope it’s approved asap. Agreed. Shovels have been in the ground..yesterday! There are million of New Yorkers who can live here. This is terrible. 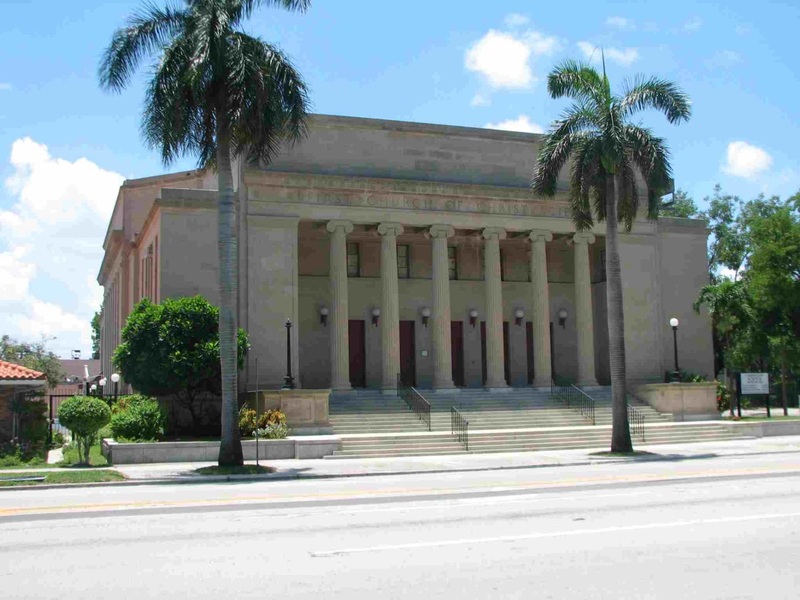 The First Church of Christ, Scientist on Biscayne Boulevard is a wonderful example of 1920s Miami architecture. It was designed by August Geiger, who also designed the Dade County Courthouse, the Miami Women’s Club, and a number of other buildings that are listed on the National Register of Historic Places. The proposed project is completely insensitive to the historic church and will likely damage the building once the columns supporting the parking structure are put in place. I hope the planning board rejects this awful design. Someone please save this city from itself! Interesting position. This building was slowly decaying in a run-down area, pretty much on the same trajectory that so many beautiful historical buildings in Detroit are. Most of which will either be demolished as a result, or become ruins on their own. Here comes the developer, who offers to incorporate this thing in a seemingly well-designed, gleaming new complex, renovate it, make it useful, maybe even glamorous – in other words, ensure that it stays alive for a long, long time. And you are reacting as if a wrecking ball was taken to it? This makes no sense at all. @XVS – I agree with you completely. Well have to rent at $4 a sft or sell for $800 a sft. Wont hapen in that location. it costs a fortune to perforate an existing structure, add pilings and foundations for a floating garage….I agree with the previous comment…”Garage Pie in the Sky”…as soon as the developers starts asking contractors from construction prices this will either change or be shelved. I don’t like it. Unless it’s a whole foods, of course. I hope it’s a Sedano’s!! 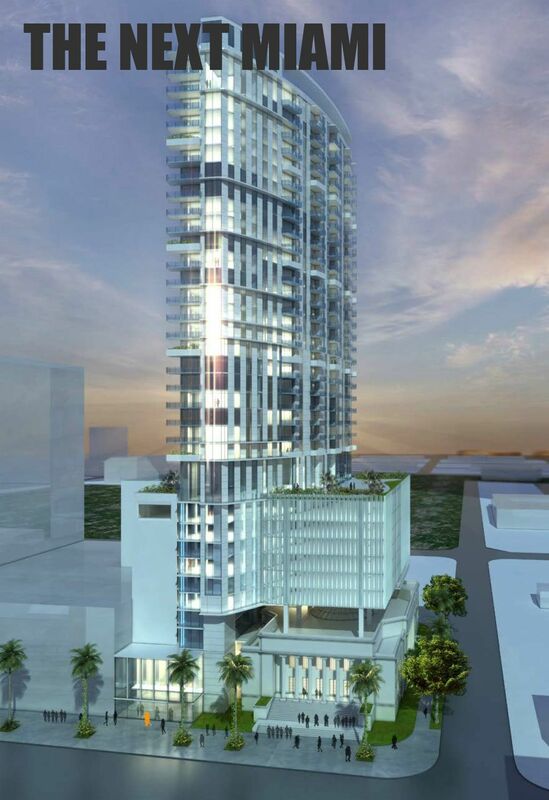 So NextMiami any news on the Chelsea tower? Last update was in June 2013. Maybe (artistically) steel mesh the garage. And no real planning …..I guess the usual for Miami. Care …..but us residents should.Enough already. Park is just a minute of slow walk away. Scale is fantastic, as is the design. Quality of life will greatly improve once the neighborhood is built up, and all kinds of businesses move in. There are are at least 3 charter schools in the vicinity – more than enough for the area that is designed mostly for young childless professionals and retired empty-nesters. Traffic is the only issue I’d agree with you on, that issue needs an urgent attention.